Now, we start our first circuit. Control an LED, switch it on and off. Well, we need a resistor with 150 Ohm or higher. It’s ok to use 180 Ohm or 220 Ohm. Look at the picture, you see our circuit. 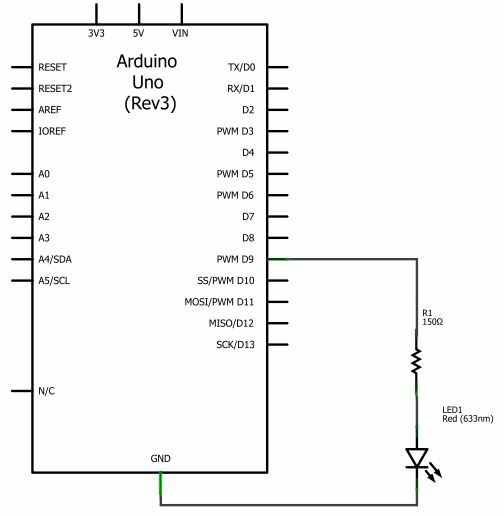 We use GND (Ground) from the Arduino and Pin 9. 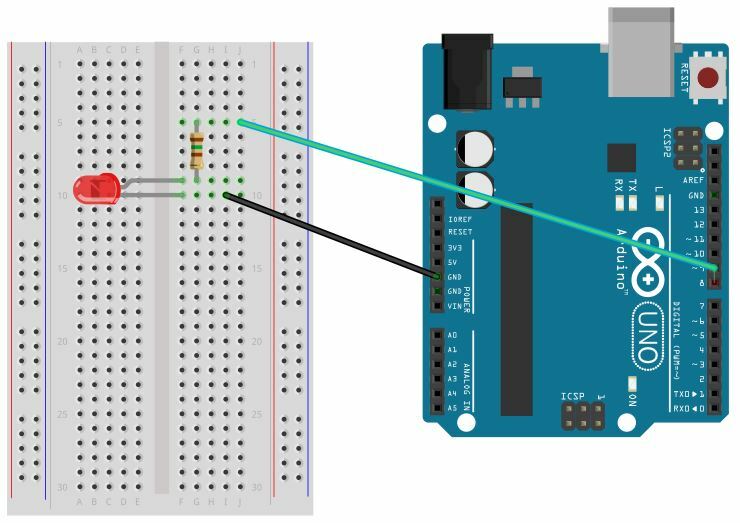 Pin 9 is connected with one row on the breadboard. In this row is the resistor connected too. The other Pin of the resistor is in the same row like the LED (anode!). We connect the second part of the LED with GND. We start our Arduino software to create the first sketch. We define a variable with the name “pinled“. The type is integer, and we assign the value 8. You remember, we use Pin 9 to communicate with the Arduino. We define the direction – we want to use Pin 9 as an output Pin. We send a “HIGH” to Pin 9. This means, Pin 8 has 5V in this moment. Current flows, and we see the LED is on! And now, we are in the LOOP. We start from the front!